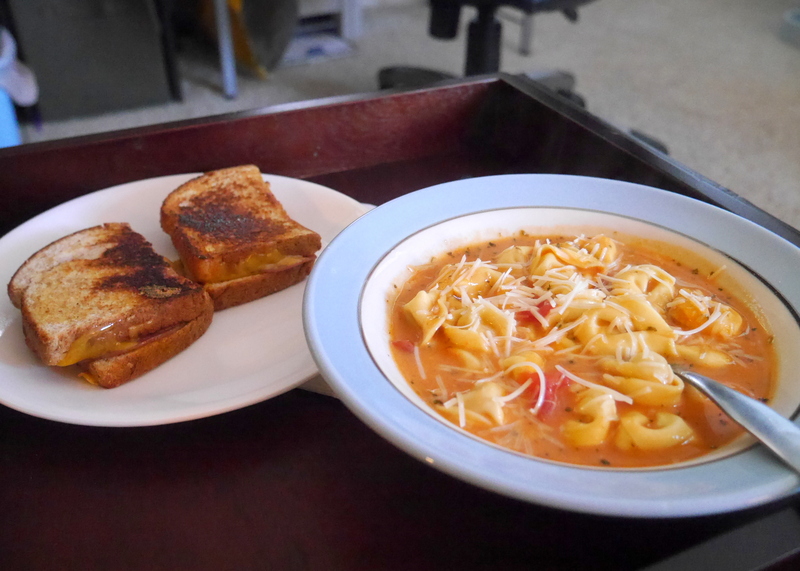 On Friday, I tried out a new recipe: creamy tomato tortellini soup. Made some grilled cheese with it and boom, I had a meal. Granted, I could have had a meal without the grilled cheese too but what would I do without those extra carbs and calories? 😉 I enjoyed the soup and will make it again. It was a nice change from the plain tomato soup that I don’t really like anymore (perhaps it’s too acidic?). It was a very easy recipe with not many ingredients and took less than 30 minutes to make. Next time though, I’m reducing the amount of Italian seasoning I put in. I think 1 tablespoon is a bit too much. On Saturday, Gene and I enjoyed the warmth by taking Pippin on a walk around the lake. Well, we didn’t make it all the way around but we got about halfway. We originally were on our own, but Pippin was hanging out in the undergrowth area by the path and heard our voices so decided to join us. He was such a cutie. He would try to pounce on the grasshoppers by jumping high into the air. He never caught one of course, but it was an adorable sight. He did end up catching a snake, though. I thought it was a mouse but out he pops with a snake wriggling around. He ended up leaving it without eating it so I’d like to think it escaped and is still alive, but I don’t know how much damage Pippin did. We were outside for an hour and a half with Pippin that when we got back, the little guy just collapsed and took quite the cat nap. 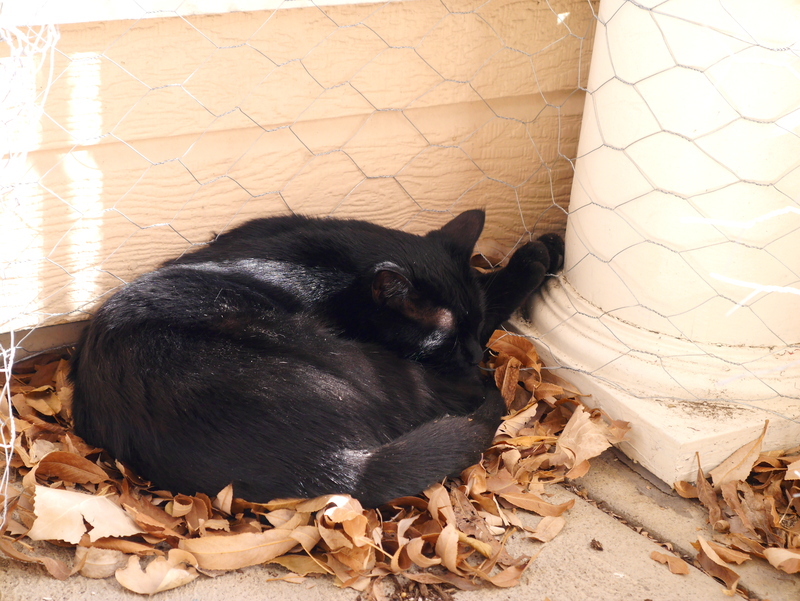 He ended up curling up on a pile of leaves in the corner of the balcony while I began to undo the chicken wire I had put up months ago. He also let me brush him for like 15 minutes, which was the longest he’s ever allowed it. He must have been really tired! On Sunday, Gene and I went to reddit game night where I played Sherrif of Nottingham and Kittens in a Blender. Both games were quite fun and may be added to my wishlist once my two best friends move over here. Hint hint. Gene and I don’t have friends over enough (if ever) to warrant buying a lot of board games. And the fact that we might move soon means I don’t want to add any other items that will have to be packed away. 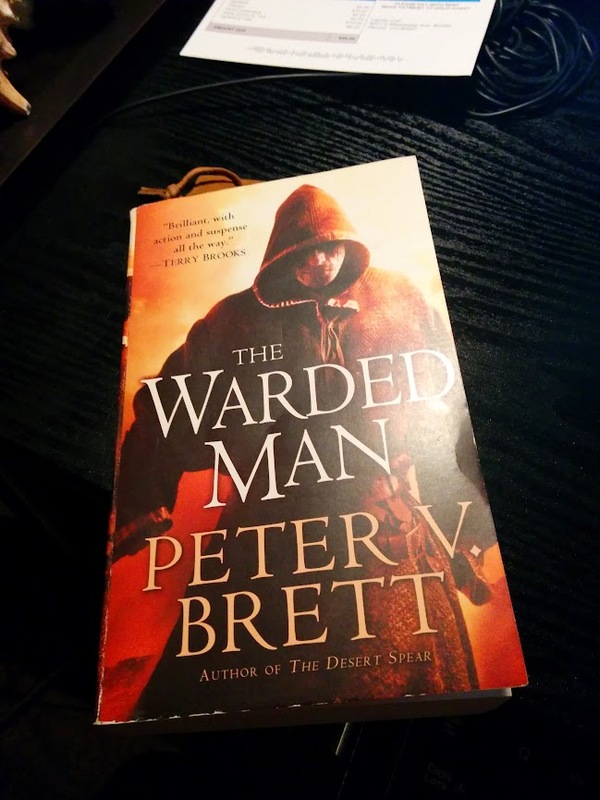 I’ve been reading the book Elisabeth sent, The Warded Man, more and more frequently now. I’m beginning to really get into it. I’m almost halfway done and the three main characters still haven’t met. That makes me a bit worried. I’m sure it’ll all work out in the end though! Today I went to work, did laundry, vacuumed, made dinner, and continued to work on the Wikipedia page I’ve been rewriting for a couple months now. I AM SO CLOSE! I emailed the subject of the page this evening and she responded saying she would read my draft. That has made my night, oh my goodness. I am so thrilled! …and tired. I think it’s time to sit back and relax my shoulders, browse reddit, and go to bed! Such a full, happy life!